A record 33.2 million Hispanics in the U.S. speak English proficiently, according to a new Pew Research Center analysis of U.S. Census Bureau data.1 In 2013, this group made up 68% of all Hispanics ages 5 and older, up from 59% in 2000. At the same time that the share of Latinos who speak English proficiently is growing, the share that speaks Spanish at home has been declining over the last 13 years. In 2013, 73% of Latinos ages 5 and older said they speak Spanish at home, down from 78% who said the same in 2000. Despite this decline, a record 35.8 million Hispanics speak Spanish at home, a number that has continued to increase as the nation’s Hispanic population has grown. These shifts coincide with the rise of U.S.-born Hispanics as a share of the nation’s Hispanic population, and the slowdown in immigration to the U.S. from Latin America. In 2013, U.S.-born Hispanics outnumbered foreign-born Hispanics by nearly two-to-one—35 million to 19 million—and made up a growing share (65%) of the nation’s Hispanic population. They are also much younger, with a median age of 19 years compared with 40 among immigrant Hispanics (Stepler and Brown, 2015). At the same time, immigration from Latin America, primarily Mexico, has slowed (Passel, Cohn and Gonzalez-Barrera, 2012), leading to fewer Spanish-speaking new immigrant arrivals and a more settled U.S. Hispanic immigrant population. As a result, since 2000, U.S. Hispanic population growth has been driven primarily by U.S. births rather than the arrival of new immigrants (Krogstad and Lopez, 2014). Fully 89% of U.S.-born Latinos spoke English proficiently in 2013, up from 72% in 1980. This gain is due in part to the growing share of U.S.-born Latinos who live in households where only English is spoken. In 2013, 40% of U.S.-born Latinos, or 12 million people, lived in these households, up from 32% who did so in 1980. The gain in English proficiency is also due to the rising share of U.S.-born Latinos who live in households where Spanish (or another non-English language) is spoken, and who say they speak English “very well.” Half (49%) of U.S.-born Latinos said this in 2013, numbering 14.7 million, up from 40% who said the same in 1980. By contrast, the share of foreign-born Latinos who speak English proficiently is little changed since 1980, even though the number that is English-proficient has grown. In 2013, 34% of foreign-born Latinos spoke English proficiently, numbering 6.5 million. In 1980, that share was 31% and numbered 1.3 million. Looked at another way, just 5% of foreign-born Hispanics spoke only English at home in 2013, about the same share (4%) as in 1980. And 29% of foreign-born Hispanics speak Spanish (or another non-English language) at home, but say they speak English “very well,” a share also little changed from the 27% who said so in 1980. Even though English proficiency is on the rise among Hispanics, there are many who speak English less than very well—or not at all. According to the Pew Research analysis, 12.5 million Hispanics in 2013 said they speak English but rate their speaking ability as less than “very well.” And an additional 3.2 million say they do not speak English at all. Together, these groups of Hispanics make up one-third (32%) of all Hispanics ages 5 and older. These groups also differ in many ways from Hispanics who speak English proficiently. 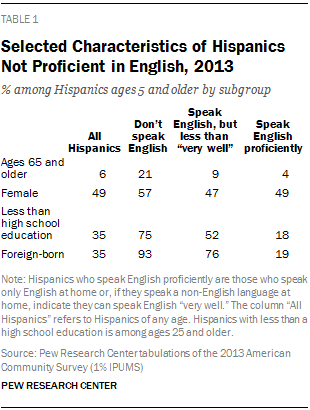 For example, 21% of Hispanics who do not speak English are ages 65 and older. Among those who speak English but speak it less than “very well,” 9% are in this age group. By contrast, among English-proficient Hispanics, just 4% are ages 65 or older. By gender, 57% of those who do not speak English are women, compared with 47% of those who speak English but speak it less than “very well” and 49% of Hispanics who speak English proficiently. Latinos’ changing language use patterns are reflected in other ways. With English proficiency on the rise among Spanish-speaking Latinos, more than half of Latino adults who are English speakers say they can speak both languages very well, according to Pew Research Center’s 2013 National Survey of Latinos (Krogstad and Gonzalez-Barrera, 2015).2 One-in-four Latinos speak only English at home. And when it comes to consuming news media, among Latino adults, a growing share get their news in English, while a declining share do so in Spanish (Lopez and Gonzalez-Barrera, 2013). Even so, for Hispanics overall, 95% say it is important that future generations of Hispanics living in the U.S. be able to speak Spanish (Taylor et al., 2012). 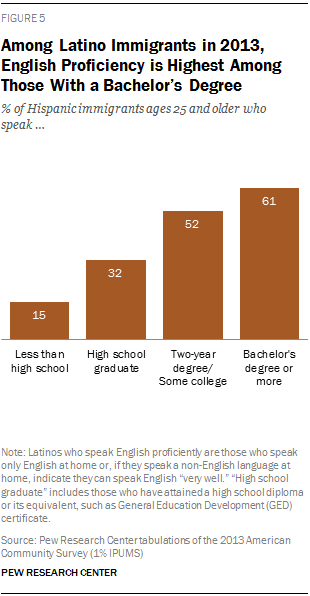 Nearly as many, 87%, say that Hispanic immigrants need to learn English to succeed in the U.S. Accompanying this report is a statistical portrait of the nation’s Hispanic population in 2013. It is based on the Census Bureau’s 2013 American Community Survey and features detailed characteristics of the Hispanic population at the national level, as well as state population totals. Topics covered include age, citizenship, origin, language proficiency, living arrangements, marital status, fertility, schooling, health insurance coverage and employment. In addition, statistical profiles of the Hispanic population in 1980, 1990, 2000 and 2010 are available, documenting trends on key demographic and economic measures among Hispanics. How is English proficiency measured? The U.S. Census Bureau determines language use and English speaking ability through a series of three questions asked of everyone 5 years old and over. The first question asks if the person speaks a language other than English at home. Those who answer “no” are classified as speaking English proficiently. For those who answer “yes,” there is a second question that asks what language they speak. These answers are assigned to 381 language categories. The third question asks how well that person speaks English, with response options of “very well,” “well,” “not well” and “not at all.” This series of questions were asked in the 1980, 1990 and 2000 censuses. Since 2010, the questions have been asked on the annual American Community Survey (Ryan, 2013). 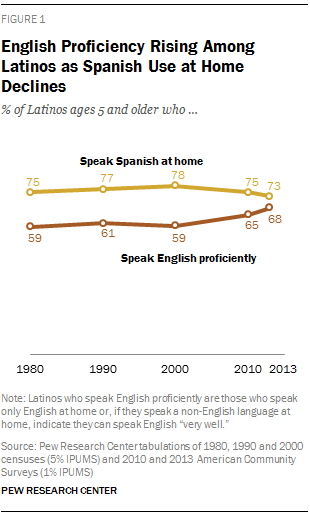 English proficiency among Hispanics is linked to age and birthplace, the Pew Research analysis finds. For example, among foreign-born Hispanics, there are marked differences in English-speaking ability trends between adults and children. Among foreign-born adults, the share that speaks only English at home or speaks English “very well” has changed little in over 30 years—it was 29% in 1980 and 32% in 2013. By contrast, there has been a sharp jump in English proficiency among foreign-born Latino children. In 1980, 43% spoke only English at home or spoke English “very well.” By 2013, that share had grown to 70%. Yet children make up a small part of the foreign-born Latino population, since most immigrants migrate as young adults who have not yet started a family. Also, as migration to the U.S. from Latin America has slowed (Krogstad and Lopez, 2014), many Latino children who arrived with their immigrant parents are now adults. In 2013, there were 1 million Latino children who were born in another country, compared with 17.9 million Latino adult immigrants. This is why, overall, just one-third (34%) of foreign-born Latinos ages 5 and older speak English at home or very well. Among U.S.-born Hispanic adults, the share that speaks English proficiently increased from 71% in 1980 to 89% in 2013. By comparison, among U.S.-born Hispanic children ages 5 to 17, the share rose from 74% to 89%. But the reasons for these changes are not the same for both groups. The share of U.S.-born Hispanic adults that speaks only English at home has increased over this period, from 28% to 40%. However, among children, there has been no change in the share that speaks only English at home since 1980, with 39% doing so then and 40% in 2013. By contrast, English proficiency is widespread among U.S.-born Latinos (25 and older) regardless of education, but still varies. Among those who have completed at least some high school, more than 91% speak only English at home or say they speak it “very well.” The share drops to 73% among those with less than a high school education. For Hispanic Immigrants, English Proficiency Rises with Years in the U.S. The Pew Research analysis finds that overall, Hispanic immigrants who have lived in the U.S. longer also have higher levels of English proficiency. This is true of Hispanic immigrant children and Hispanic immigrant adults. However, the analysis also shows that the share of Hispanic immigrant children who speak English proficiently is higher than that among Hispanic immigrant adults, no matter how long each group has resided in the U.S. Among children (ages 5 to 17) in the U.S. for five years or less, 46% speak English proficiently. This share rises to 84% among foreign-born Hispanic children who have been in the country 11 to 15 years, and reaches 85% among those in the country 16 to 17 years. English proficiency also steadily increases among foreign-born Latino adults along with years lived in the U.S. Some 19% of immigrant Latino adults who have been in the U.S. for five years or less speak English proficiently. This share rises to 39% among those in the country more than 20 years. As of 2013, 73% of Hispanics spoke Spanish at home, a share little changed since 1980 (75%), but down from its peak of 78% in 2000. Nonetheless, the number of Hispanics who speak Spanish at home continues to grow, as the Hispanic population continues to grow. In 2013, 35.8 million Hispanics3 ages 5 and older did so, up from 34.3 million in 2010, 24.6 million in 2000 and 9.8 million in 1980. Spanish use at home is more widespread—and has been more stable—among immigrant Hispanics than it has been among U.S.-born Hispanics. Fully 95% of foreign-born Hispanics spoke Spanish at home in 2013, a share little changed since 1980, when 93% of foreign-born Hispanics spoke Spanish at home. But among the U.S. born, this share has declined from 67% in 1980 to 60% in 2013. About 15.7 million Latinos ages 5 and older who speak Spanish at home speak English less than “very well” or not at all. Among Spanish-speaking Hispanics, the share not proficient in English declined from 54% in 1980 to 44% in 2013. Among Hispanics ages 5 and older born in the U.S., there has been a sharp decline in the share that does not speak English proficiently. In 1980, 28% spoke Spanish at home and said they did not speak English proficiently. This share had dropped to just 11% by 2013. By contrast, among foreign-born Hispanics over the same time period, there has been no decrease in the share that speaks Spanish at home and does not speak English proficiently. In 1980, 67% of foreign-born Latinos spoke Spanish at home but also did not speak English proficiently, compared with 66% in 2013. This report examines language use trends since 1980 among the U.S. Hispanic population ages 5 and older in the 50 states and the District of Columbia, focusing on the languages spoken in Hispanic households and the share of Hispanics who are proficient in English. Accompanying this report are demographic and economic profiles of the U.S. Hispanic population, including trends for several characteristics since 1980. The data for this report and the accompanying statistical profiles are from five main sources. The first two are the U.S. Census Bureau’s 2013 and 2010 American Community Surveys, which provide the most recent detailed geographic, demographic and economic characteristics for the nation’s Hispanic population available. The other data sources are the 1980, 1990 and 2000 decennial censuses (5% IPUMS). This report was written by Jens Manuel Krogstad, Renee Stepler and Mark Hugo Lopez. The authors thank Ana Gonzalez-Barrera and Jeffrey S. Passel for editorial guidance. The accompanying statistical profiles were compiled by Renee Stepler and Anna Brown. Anna Brown number checked the report. David Kent was the copy editor. Michael Suh developed the online statistical profile interactive accompanying this report. Find related reports online at pewresearch.org/hispanic. “Foreign born” refers to people born outside the U.S., Puerto Rico or other U.S. territories to parents neither of whom was a U.S. citizen. “Speaking English proficiently” or “English proficiency” refers to those who speak only English at home or those who speak a language other than English at home and indicate they speak English “very well,” the highest response category on a four-point scale of English speaking ability. 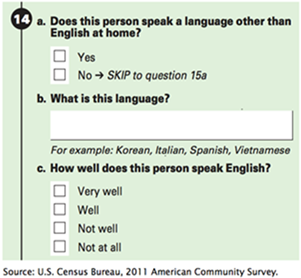 Those who do not speak English proficiently include those who speak a language other than English at home and indicate they do not speak English or indicate they speak English “well” or “not very well.” This information is self-reported in U.S. Census Bureau surveys such as the American Community Survey.